Cancer is one of the leading causes of death worldwide. The American Cancer Society estimates that in 2018, there will be 1,735,350 people diagnosed with cancer; at the same time, 609,640 cancer-related deaths in the United States. The statistics suggest the most people know someone affected by cancer. 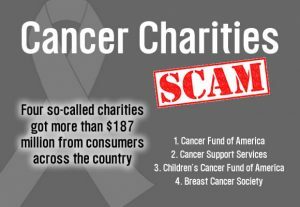 Sadly, scammers take advantage of this fact and try to bilk unsuspecting people out of money in the name of cancer research or a related charity. There are many reputable and honorable charities. However, scammers aren’t in that prestigious group. Rather, the scammers take the money you have given in good faith to use for their own purposes. Regardless of popular belief, scams aren’t only perpetrated by individuals hiding in dark basements or Nigerian prisons. So-called legitimate companies often take part in aggressive telemarketing campaigns to collects funds. On the surface, these charities seem to be honest. If you dig deeper, you’ll find that it’s a front. 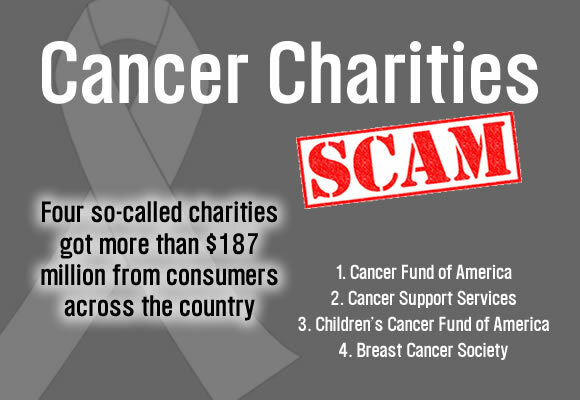 In 2015, the Federal Trade Commission filed charges against four charities claiming to collect money to combat cancer. The representatives lied to potential donors to gain sympathy, and then they walked away with almost $200 million in donations. As a matter of fact, the CEOs use the money to buy luxury vacations and pay salaries to family members. Question the caller about the charity. Ask the representative for information about the organization. The caller should supply his full name, the charity’s legal name and address, and how donations are allocated. Scammers may be unable to give an appropriate answer, get defensive or hang up. Use an app for unknown number look ups to identify the phone number. Do not donate at the time of the call. Research the organization online to verify its existence and credentials. Legitimate charities are registered with the state, and national organizations can be verified through the Better Business Bureau’s Wise Giving Alliance. If you have determined that the charity is legitimate you can call back or donate via their website. If you donate, be sure to get a receipt. Scammers will often play on your emotions. They may use guilt to get you to donate. Whenever a caller asks for a certain dollar amount, hang up. The best protection is to avoid answering unknown calls. If you think a call is a scam, call the FTC immediately.